Blessed Joseph Gerard was born on March 12, 1831, and was a French Catholic Missionary who worked among the Basotho people of modern day Lesotho and the Free State province of South Africa. He was born in Bouxieres-aux-Chenes, France, and received his religious training from the Missionary Oblates of Mary Immaculate. He joined them when he was twenty. He was more advanced in learning new languages than his academics, which was very useful for his foreign missionary work. Joseph moved to South Africa in 1852 at the age of 21, and never returned to his home country again. Joseph was ordained a Priest at Pietermaritzburg in 1854, and started his missionary work among the Zulus in the Vicariate of Natal, with little success. 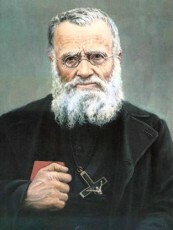 In 1862 he joined Fr. Francois Allard, the Bishop of Natal. They together started the first Catholic Mission in Lesotho. Lesotho already had a Protestant Congregation founded by the Paris Evangelical Missionary Society, but this would be the first Catholic Mission. With permission from the Moshoeshoe government, they founded the “Village of the Mother of Jesus” mission 20 miles south of Thaba Bosiu, today the site of present day Roma. Joseph was well respected by the Moshoeshoe for remaining in the country during the Free State vs. Basotho Wars, and it was at his encouragement that the chief sought British intervention at the end of the conflict. Although he was accepted and respected, his missionary work progressed slowly and by 1879 there were only 700 Catholic in the country. Still, Joseph pushed forward, setting the example for all to see, an effort that would pay off in many more joining the faith. In 1875, Joseph founded the St. Monica mission in the Leribe District in northern Lesotho. From that location, he ministered to both missions. He did return to the Roma Congregation in 1898 where he continued to work as a missionary for the rest of his life. He died on May 29, 1914 at the age of 83. As a result of his life’s work, Catholic Christianity is the majority Religion in present day Lesotho. Pope John Paul II beatified Joseph Gerard on September 15, 1988 in a Mass conducted at Lesotho’s capital Maseru. The Oblates of Mary Immaculate, and the Roman Catholic Church celebrate his feast day on May 29th. Joseph Gerard was born on March 12, 1831, and was a French Catholic Missionary who worked among the Basotho people of modern day Lesotho and the Free State province of South Africa. He was born in Bouxieres-aux-Chenes, France, and received his religious training from the Missionary Oblates of Mary Immaculate. Joseph moved to South Africa in 1852 at the age of 21, and never returned to his home country again, soon being ordained a Priest. In 1875, Joseph founded the St. Monica mission in the Leribe District in northern Lesotho. From that location, he ministered to both missions in Lesotho. He did return to the Roma Congregation in 1898 where he continued to work as a missionary for the rest of his life. He died on May 29, 1914 at the age of 83. As a result of his life’s work, Catholic Christianity is the majority Religion in present day Lesotho. Pope John Paul II beatified Joseph Gerard on September 15, 1988 in a Mass conducted at Lesotho’s capital Maseru. The Oblates of Mary Immaculate, and the Roman Catholic Church celebrate his feast day on May 29th.